We all like to make fun of blondes. It seems, blondes have been getting a bad rap throughout history. 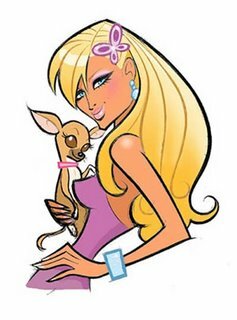 I have even fallen prey to those prejudicial thoughts about blondes, although I grew up, at least partially blonde for most of my life. I say partially blonde because my hair color has become darker over time. My driver's license still says blonde but my hair color is really brown now. I still get the blonde highlights in summer when I'm out in the sun. Some of the blonde is even lasting throughout the year-and by blonde, I mean REALLY blonde -- silvery-white, even. Yes, we all like to make fun of blondes, tell dumb blonde jokes, create funny audio clips about blondes using an Onstar product called "Blondstar" (ok, I'll admit that one is pretty funny.) But that kind of thinking is very prejudicial in it's nature. The other night, I found myself falling prey to those prejudicial thoughts as I watched a pretty young blonde girl (my wife calls them "the pretty people") standing in front of us at the gym trying to run her identification card through a scanner. Problem was that the card did not have a magnetic strip, only a bar code. and she was trying to run it through the wrong machine. The scanner she needed was right there, standing in glory all big and bulbous on the counter. After a few frustrating moments, I finally told her that it might be easier to just put her card in front of the infra-red bar code scanner. She did exactly as I had suggested and plastered her identification right up on the little red screen. Of course, the reader did not work. By now, a line was forming behind her, and my wife was starting to make funny huffing noises and tapping her feet on the floor so loud I think it might have been heard in the locker rooms. My wife and I started to exchange looks and snicker under our breath at this woman's inherent stupidity. Looks are all we need now. It is a superpower developed over nearly twenty-five years of marriage. Oddly enough though, it only works when judging others in public. I still have not developed the ability to understand exactly what my wife means by what she says -- and yes, they are usually different. So, it seemed, I was falling into the enticing abyss of prejudice. To make a long story short ... I know, too late. Anyway, the pretty young blonde girl finally gave up, or maybe we nudged her out of the way, however it happened, she gave up and sought out the help of the attendants at the front desk. The rest of us hurried through the line, flashing our cards up to the reader, wiggling them just a little as the scanner read each one in rapid succession. My wife went in to her step aerobics class and I headed for the treadmill room with a thousand ill-perceived thoughts and blonde jokes running through my head. Needless to say, I didn't make it far, as the treadmill proved much more complicated than I can remember a treadmill was. It was all computerized with connections and screens with icons that didn't explain anything. 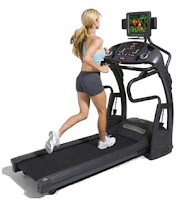 I was still trying to figure out how to make the dadblasted thing go, when the dumb blonde walked into the room and found a treadmill in front of mine. After what seemed minutes of screen-tapping and grunts of frustration, she finally turned with a sour look on her face, quickly pushed on the touch-screen a few times, and got my treadmill going. The workout went much better after that, and I was made to rethink my ill-thoughts of blondes as she not only proved smarter than I gave her credit for, she provided me motivation for the rest of my workout as I watched her gliding effortlessly on the treadmill in front of me. I guess next time, I won't be so quick to judge. Why do brunet women tell blonde jokes? They have to have something to do on a Saturday night when their boyfriends are out with a blonde.......LOL!!!! I guess we all have our own preconceived thoughts on people. My peeve is the guys in the trucks that drive like old ladies and I am still waiting to have that mindset proven wrong. But hey, you weren't there the FIRST time she tried to treadmill! Might've been like the card scanning fiasco. 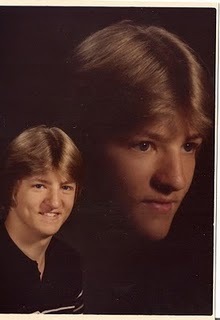 I'm so glad my high school pics didn't include the pose in duality. Aside from that, nice feathering of the hair. Alex-Yeah, I swear the invention of the bar code reader was a precursor to the apocalypse. I often wonder if they put those self-checkouts in WalMart just to make people feel stupid. They never seem to work right. And, before long, some nearby attendant has to come in like "Nick Burns, Your company computer guy" to say "Move" and make it work. Thomas-I used to pay big bucks and search three counties to find the "stylist" that could feather hair just right. Now, I'm afraid to let my hair grow that long because it might have too much blonde in it. I'm blonde! poor from all the money i spend to be a brunette!!! I am going to tell you this horrible blonde thing I did- twice when I was supposed to go to shoney's, I went to Applebee's instead and waited for the people I was supposed to meet! It ws lunch not writers group but still I sat there waiting before I realized I was at the wrong place. dolhhhhh!!! The actress Judy Holliday had an IQ in the 150's and I'm sure she laughed all the way to the bank. Anytime I hear someone snicker about Jessica Simpson, I remember Judy Holliday and wonder if she's doing the same thing. James we missed you at the meeting. We were told your coverup story. I know you were just out road running too late.I have a new song I am working on called "Steel and Plastic" that fits in well with your blond blog. I will try to have it ready for you. By the way I just put more blonde in my hair just for spite...LOL!!! See you there blondie. Heres the problem I have with this. If people are steriotyped or joked about in such a manner because of their SKIN color then thats considered bad because it's "racist", .. . yet it's alright to steriotype and tell these kinde of jokes about someone on account of their HAIR color ! !